Our standardised lists of assessments, assessment points, subjects and facets make it easier to integrate your data with assessment-specific products. Before mapping your assessments, you need to map your subjects. Assessment mappings are used to map SIMS Aspects to the Assembly assessment model. Each SIMS Aspect needs to be mapped to an Assembly assessment, subject and facet. Assessment point mappings are used to map SIMS Result Sets to the Assembly assessment model. Each SIMS Aspect much be mapped to one Assembly assessment point. 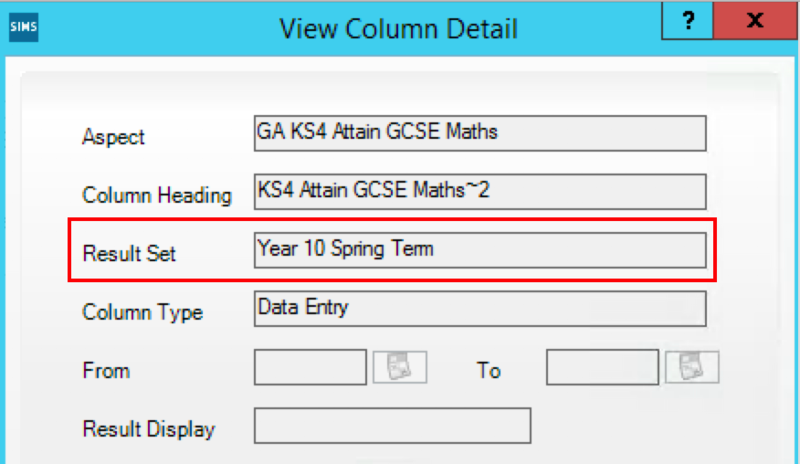 On SIMS go to Focus > Assessment > Marksheet Entry and select the marksheet containing data you want to import in to Assembly. This will bring up the Marksheet with students and their marks. 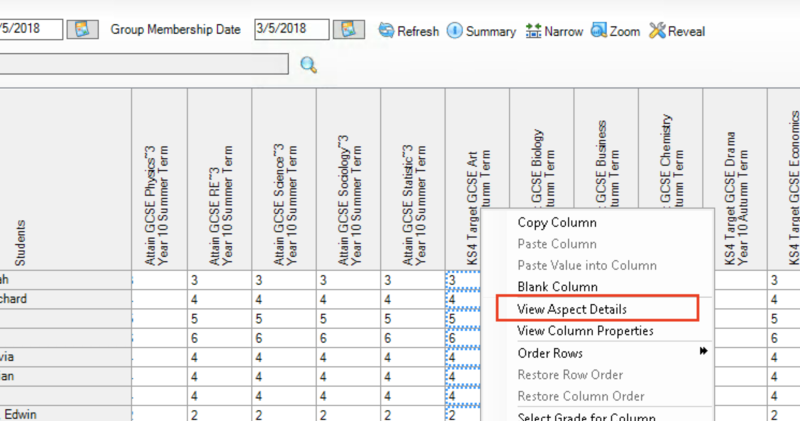 Select a column and right click to View Aspect Details. Make a note of the Name field in the View Grade Aspect window. 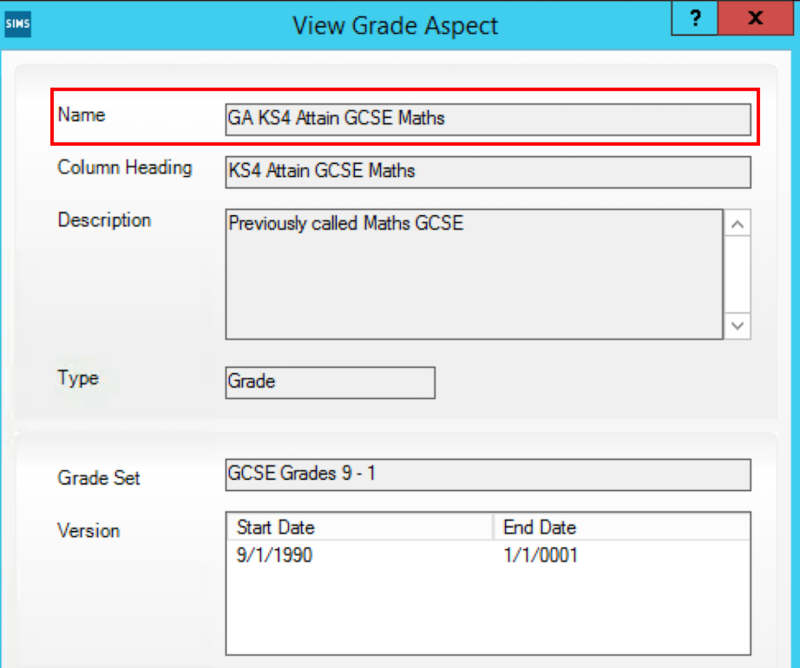 When logged in, go to the Assessments area of the Platform and click Add Assessment Mapping. If this button is not visible, you should make sure that you have authorised an app that requires assessment data. Start typing in the SIMS Aspect field - this is the Aspect Name that you located earlier that results will be imported for. Match this up to the equivalent Assembly assessment. 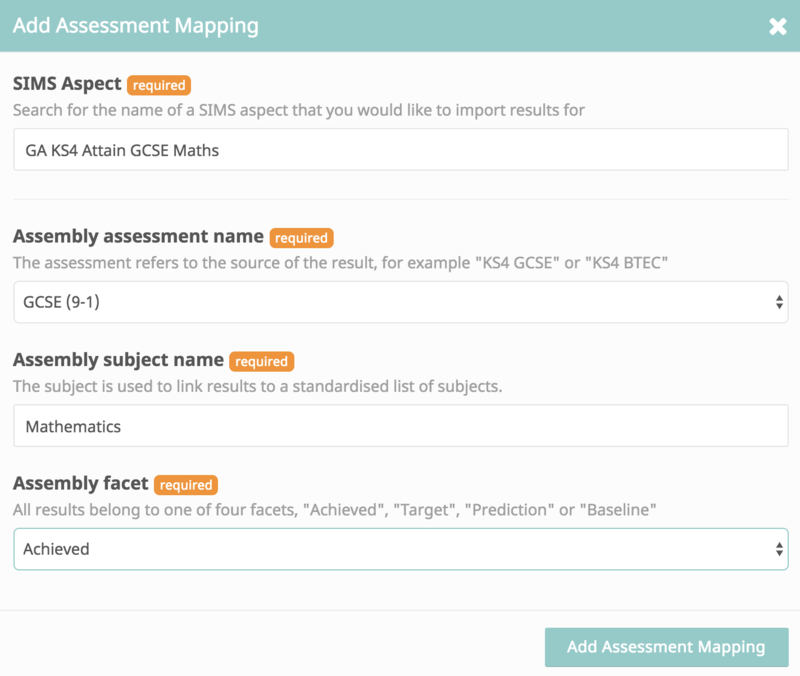 You can find a list of all Assembly KS4 assessments here and all KS5 assessments here. You should make sure the "grades" match the grades you have entered on SIMS. If you can't find an equivalent assessment, please let us know. Match the SIMS Aspect up to the equivalent Assembly subject. Match the SIMS Aspect to the equivalent Assembly facet. The "Achieved" facet is used for current attainment grades for a student (as opposed to "Target" or "Prediction"). Repeat these steps for all Aspects that you want to import results for. This will bring up the Marksheet with students and their marks. Select a column and right click to View Column Properties. Make a note of the Result Set field. 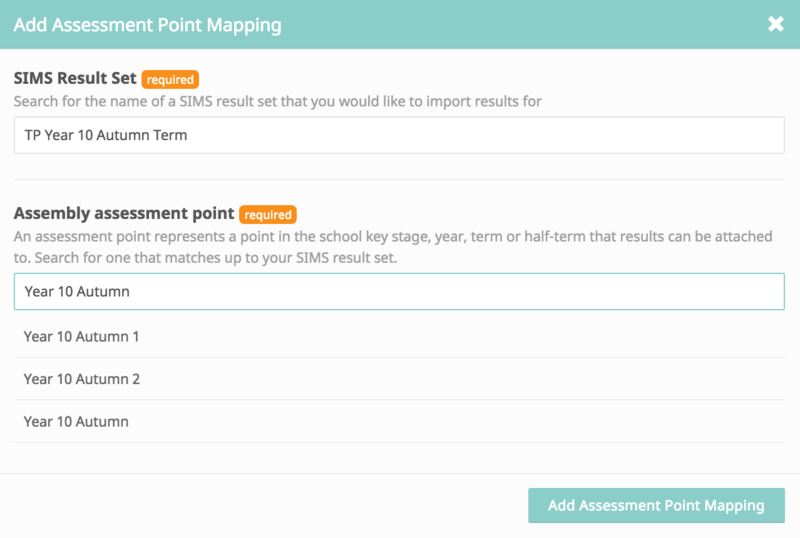 When logged in, go to the Assessment Points area of the Platform and click Add Assessment Point Mapping. Start typing in the SIMS Result Set field - this is the Result Set that you located earlier that results will be imported for. Match this up to the equivalent Assembly assessment point. Repeat these steps for all SIMS Results Sets that you want to map.